The ATSISPEP report, recently handed to the Prime Minister, recommends that all Indigenous suicide prevention programs be evaluated for effectiveness amid evidence the majority of existing programs are failing. It recommends that Aboriginal Community Controlled Health Services are positioned as the primary providers of mentalhealth care to Indigenous people, using funding channelled through mainstream Primary Health Networks. Aboriginal suicides are at record levels in remote Australia and mainstream prevention programs are failing, a major report has concluded. 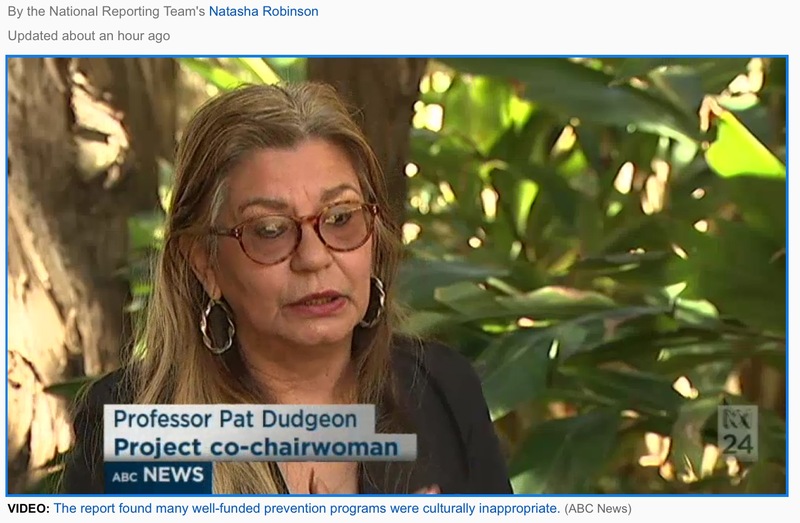 The ABC has obtained a copy of the Aboriginal and Torres Strait Islander Suicide Prevention Evaluation Project (ATSISPEP), co-chaired by West Australian professor Pat Dudgeon and former social justice commissioner Tom Calma. The report calls for a radical rethink in Indigenous mental health policy to place Aboriginal people at the centre of care. It calls for the immediate development of an Indigenous-led national prevention plan to stem a rising tide of Aboriginal deaths. The project forms the foundation of the Federal Government’s policy response to the Indigenous suicide crisis, which has claimed 680 Aboriginal lives between 2011 and 2015. The report also calls for teams of support workers that fly to a community in the wake of a suicide to be expanded nationwide. The Critical Response Project is currently being trialled in suicide hotspots in Western Australia. There is a national focus on Indigenous suicide this week as Health Minister Sussan Ley prepares to chair a special roundtable on suicide prevention in the Kimberley. WA was rocked by another tragedy this week with the death of a 37-year-old mother of three, who took her life in Kalgoorlie, the Goldfields town that recently exploded into racial unrest following the death of 14-year-old Elijah Doughty. Elijah died after being allegedly run down by a motorist outside the town. During the past two-and-a-half years, ATSISPEP members have toured the country talking to Indigenous people about suicide and resilience. They have been told of mass frustration at the coalface. Many well-funded programs are culturally inappropriate, and many Aboriginal-led programs struggle to gain access to funding. The ATSISPEP report profiled 19 Indigenous-led initiatives that have been working to combat Indigenous suicide. There’s a suicide epidemic in remote Australia. These are the people trying to pick up the pieces. The Federal Government late last year announced a renewed approach to national suicide prevention through the establishment of a National Suicide Prevention Strategy. In August it announced that the Kimberley — which has one of the highest Indigenous suicide rates in the world — was designated as one of 12 suicide prevention trial sites. But there is concern among Indigenous leaders that policy development is proceeding even before the ATSISPEP report has been released. ATSISPEP co-chair Professor Dudgeon said she thought the report would “show the way forward”. “There aren’t many Aboriginal families who aren’t touched by suicide. And I think with suicide, it’s a more poignant grief because the person has chosen not to be here,” she said. “It’s ongoing trauma with little opportunity to recover. Suicide researchers have been warning for several years that the rising rates of Indigenous suicide nationwide amounts to an epidemic. The Australian Bureau of Statistics recently released figures that showed Indigenous suicide rates have been escalating steadily for the past decade. The West Australian Government recently claimed deaths by suicide in the state were decreasing, but that has been disputed by Aboriginal leaders in the policy area. More than 152 Aboriginal people died by suicide in 2015, including 110 men and 42 women. Indigenous suicide was almost unheard of prior to the 1960s. 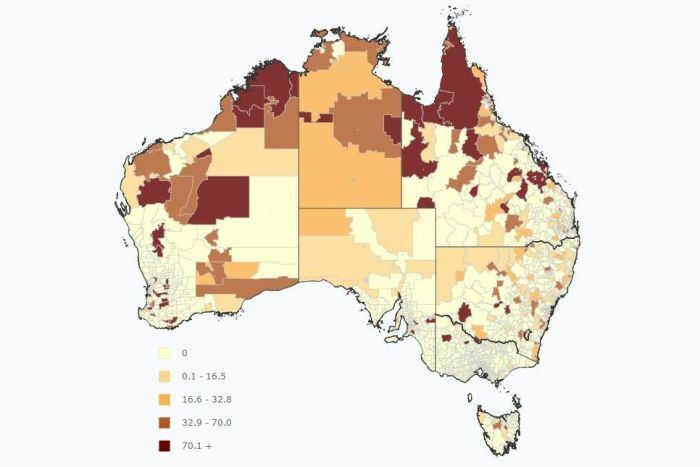 But in 2015, suicide was the fifth-leading cause of death for Aboriginal and Torres Strait Islander People across NSW, Queensland, SA, WA and NT, compared to the 12th-leading cause of death for non-Indigenous people. However, for Aboriginal children, the statistics are even more grim. They make up one in three child suicides. WA academic Gerry Georgatos argued the official figures significantly under-represented true Indigenous suicide rates, especially in remote areas. Mr Georgatos believes suicide accounts for one in 10 Indigenous deaths, much higher than the official nationwide figure of one in 19. 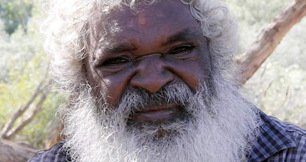 “The suicide Aboriginal suicide crisis is a humanitarian crisis,” Mr Georgatos said. Mr Georgatos has spent years accurately documenting suicide rates using both official figures and grassroots reports from around the country and has played a frontline role in supporting families affected by suicide. “The grim reality that I see on the ground, our nation should weep,” he said. “The disconnect is not with culture. The disconnect is actually with hope. Lifeline Australia is currently developing a clear understanding of services to help reduce Aboriginal and Torres Strait Islander suicide delivered by Lifeline and other organisations across Australia. The survey will look at better ways it can support and work with Aboriginal and Torres Strait Islanders organisations across the country. This survey will take approximately ten minutes too complete. The information gathered will be used to help identify ways to improve services to better support our Aboriginal and Torres Strait Islander peoples, and reduce the rate of suicide in these communities. Thank you for taking the time to provide this important feedback. The information gathered will be used to help identify ways to improve services. Thank you for taking the time to fill it out. The Report doesn’t say this. ABC is wrong.